Some states are more prone to victimization by tornadoes and hurricanes than others. Expert meteorologists contend that Kansas, for example, is so often buffeted by tornadoes because of the alignment of the Rocky Mountains, the flatness of the great plains, and the direction of prevailing winds (1). They are wrong. Their analysis is incomplete because it does not consider the popular notion that tornadoes are most common, simply, in states with many mobile homes (2). Below I attempt to justify, and, if possible, quantify this and other common beliefs about tornadoes. 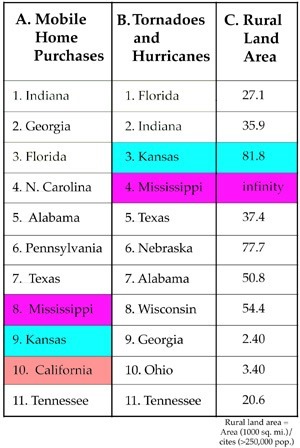 A state-by-state comparison was made between the number of tornadoes (3) and purchases of mobile homes (4). Data sets were standardized to each state's area (5) and results shown in Tables A and B. 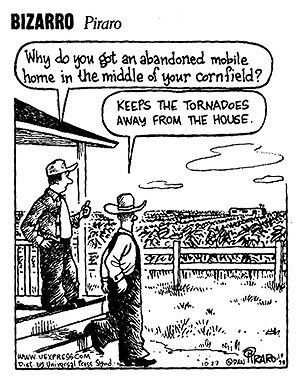 However good the correlation between the presence of trailer parks and tornadoes, it is not perfect. To account for the imperfections, I analyzed another popular myth (8): the idea that states with many large cities have fewer tornadoes -- it is claimed that the buildings act as windblocks. To test this idea, I divided the land area of each state (5) by the number of large cities (those having a population of at least 250,000; ref. 5) to obtain a figure I call the "rural land area". See Table C.
The occurrence of tornadoes seems to depend on both the number of mobile homes and the absence of large cities. For instance, Kansas, with a whopping 81,800 rural square miles, moves up from ninth on the mobile home list to third on the tornado list. Nebraska, with 77,700 rural square miles, moves from Number 16 on the mobile home list to the sixth position on the tornado list. In contrast, California has many large cities (only 19,500 square miles between them), and is subject to very few tornadoes (0.25 tornadoes/10,000 square miles/year). California, of course, makes up for the deficit in violent storms with a proud abundance of earthquakes. 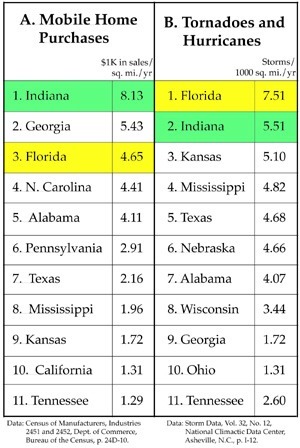 Curiously, some states with a high rural land area do not have a corresponding increase in violent storms. Alabama, for example, falls down the chart despite having a high rural land area (50.8). Also, Mississippi has an increase in tornadoes expected by its lack of cities. However, because there are no cities (and thus its rural land area is infinite), one might expect there to be a constant scouring of the state by violent storms, all tornadoes, all the time. This, of course, does not happen. This situation was puzzling until it was realized that many of the states not simultaneously experiencing increased tornadoes and rural land area are, in fact, poor states. Poverty can be measured by several different means, including annual family income. However, we focus here on economy level as indicated by amounts of purchases of electronic devices, particularly video cameras. A recent addition to tornado lore is the notion that rising sales of video camcorders somehow increased the number of tornadoes (9), as if, perhaps, the tornadoes were "posing" for pictures. 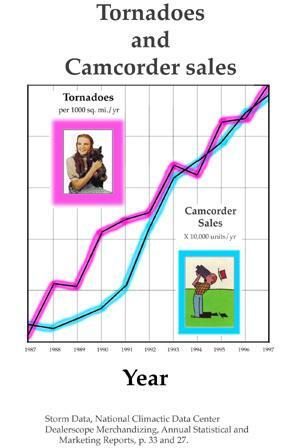 To test this far-fetched hypothesis, I compared the sales of camcorders (10) to the occurrence of recent tornadoes (11). I found that, surprisingly, there is a direct correlation (see below). 1. Real statistics can be used to verify virtually any hairbrained fable about tornadoes. 2. If case these ideas turn out to be true, I recommend that if you build a house, make it sturdy and site it near a city, far from trailer homes, behind a big rock, and don't let anyone with a camcorder near the place. 1. New York Times, April 28, 1991, p. 22. 2. Cecil Adams, "The Straight Dope", In Isthmus (Madison, Wisconsin), Jan. 14, 1994, p. 30. 3. Storm Data, Vol. 32, No. 12 (Dec. 1990), National Climactic Data Center, Asheville, N.C., p. I-12. 4. 1987 Census of Manufacturers, Industry Series, Wood Buildings and Mobile Homes, Industries 2451 and 2452, Dept. of Commerce, Bureau of the Census, p. 24D-10. Unfortunately, some states were not included in this published data. 5. World Almanac and Book of Facts (1991), Pharos Books, New York, pp. 619-643. 6. Reference omitted by common consent. 7. Reference omitted for unstated reason. 9. The Capital Times (Madison, Wisconsin), July 7, 1994, p. 3A. 10. Dealerscope Merchandising, Annual Statistical and Marketing Reports, May, 1994, p. 33; March, 1992, p. 27. 11. Storm Data, vol. 34, no. 12 (December 1992), p. 92. Originally published in The Annals of Improbable Research, 1995, vol. 1, no. 4 (July/August), pp. 26-27. Reprinted in The Best of the Annals of Improbable Research. Cited in The Atlantic Monthly, 1996, Vol. 278, No. 6 (Dec.), "A Few Loose Ends" by Cullen Murphy, pp. 18-21. Back to Kitsch Tour U.S.A.